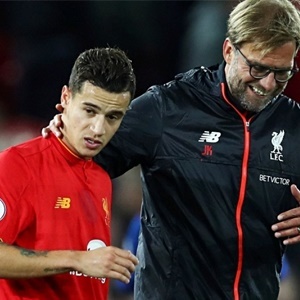 Cape Town - Liverpool boss Jurgen Klopp revealed he had a positive conversation with Philippe Coutinho on the playmaker's return to training on Thursday. The Brazil international, who was the subject of three failed bids from Barcelona during the recent transfer window, has missed the opening three games of the new Premier League campaign with a back injury. Coutinho handed in a transfer request last month in an attempt to engineer a move to the Camp Nou, but the Reds insisted they would entertain no offers for the Samba star. He linked up with Canarinho for their World Cup qualifiers against Ecuador and Colombia, coming off the bench in both matches, with national-team doctors claiming his injury had been stress-related. The 25-year-old was back at Melwood for the first time this season after the international break, and Klopp admitted he has some work to do on the training pitch before being considered for selection. "I know what people think, but Phil had the back problem a few weeks ago and couldn't train so that means he missed around about three weeks," the German said on the club's official website. "Yes, he went to the national team and trained normally, but now we have to prepare for a normal season so we have seven games [before the next international break] and we saw training this morning and thought 'OK, maybe we should use him immediately' because he was really good, but that doesn't make sense. "We have now to continue with the pre-season, not too long, but in a few sessions we have to give ourselves the time because in the next month we have seven games. "We always have the same decision to make, 'does he need training or can he play?' and all that stuff. Yes, he will now do a little bit more than the other boys but he showed up in a very, very good mood and looks really promising." Asked if he spoke with Coutinho, Klopp replied: "Of course - all good, all good. Nothing else to say, actually, so he's back and we had a really good conversation, so good."